Brookhaven Retreat Welcomed Dr. Jennifer Payne on August 1st and 2nd for Peer Review and Training. Brookhaven Retreat®, LLC, a unique residential treatment facility exclusively for women with mental health and/or substance abuse issues, welcomed Dr. Jennifer Payne on August 1st and 2nd for Peer Review and Training. Brookhaven Retreat welcomed the director of the Women’s Mood Disorder Center, and Associate Professor of Psychiatry and Behavior Sciences at John Hopkins School of Medicine, Dr. Jennifer Payne. During the two-day visit, Dr. Payne offered peer review and support onsite and also led an offsite comprehensive training for professional staff. On August 1st, Dr. Payne offered professional guidance and peer review to Brookhaven Retreat’s treating psychiatrist, Dr. Kelly Ownby. Dr. Payne and Dr. Ownby worked closely and discussed treatment options, goals, and plans with current clients. 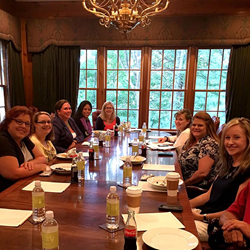 On August 2nd, Brookhaven Retreat hosted a comprehensive offsite training for clinical staff at Blackberry Farms in Walland, TN. Dr. Payne led an open discussion titled “20 Techniques Used to Communicate with Clients”. Staff that attended the training included: Chief Manager: Jacqueline Dawes; Psychiatrist: Dr. Kelly Ownby; Primary Therapists: Marlaina Kincaid, Katherine Myers, and Lana Wilcox; Registered Nurses: Lisa Nobles, Kaitlyn Taylor, Melissa Galant, and Alicia Ogle; and Risk Manager: Perry Kinser. As part of The Lily Program®, a 90-day treatment for women offered exclusively at Brookhaven Retreat, clients receive medical and clinical care from highly skilled professionals to provide the highest quality of care. Ongoing training, open discussions, and collaborating with top professionals, such as Dr. Jennifer Payne, provide a comprehensive environment of care and knowledge so a client can achieve sustained mental wellness and long-term recovery. Communication of providers is essential to living a healthy life. When providers are in contact with one another, resources and knowledge can be combined, experiences can be shared, and diagnosis and treatment recommendations can be discussed. As a result of the different angles of treatment being review, a full comprehensive plan of care can be developed and implemented.